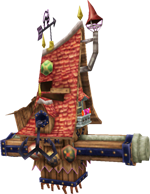 I wanted to create a thread to discuss some of the most memorable enemies in FFIX. This can include bosses, too. I've played this game several times, and there are certain enemies that I always look forward to, and get excited when I get to battle them. The three Black Waltzes immediately come to mind. They have such interesting character designs, and it's really neat that there is three of them! Also, remember the part with the blizzard, when your party falls asleep, and the camera pans upward to reveal the Black Waltz at the top of the cliff? So creepy. Next is definitely the Gizamaluke. Just seeing a water-based dragon come through an ancient wall underground is just really neat, and the grotto that is named after this beast is also a really cool place to explore. Another one for me is the Ironite. I always thought that it had a really cool design for a dragon. Also, the fact that you can climb up the ladder in Gizamaluke's Grotto and battle a Grand Dragon early on in the game (and be completely squashed by it) was also cool, although frustrating the first time you do it and die. What do you guys think? What are some of the more memorable enemies in FFIX? Which ones do you always look forward to battling? I had forgotten some of the great ones before I replayed on Steam a couple years back, myself. There are some really great designs in there, agreed. I am a big fan of Epitaph, Yan (so cute! ), Gimme Cat, the friendly Ghost, and this game's take on Hades for those reasons, for sure. The Black Waltzes were also amazing because they did so well at taking that well-loved Black Mage design and making it really menacing. Why aren't you shopping AmaCoN? Oh man, I forgot all about the Gimme Cat! So great!